http://cinziamazzamakeup.com/?x=miglior-sito-per-acquistare-viagra-generico-100-mg-a-Bologna First Day of First Grade for Emma! source link Here we are again getting ready for scan day. As I look back at our posts, I guess we haven’t updated the website since the last time we did scans in July. Sorry about that! A lot has happened since then…it is crazy how fast time goes by sometimes. http://cinziamazzamakeup.com/?x=acquistare-cialis-online-forum The last time we updated, we had learned that Emma’s scans had shown small growth and that we would need to start treatment again. After lots of time discussing the best treatment for Emma with our doctors we decided what we would do. I really love that our doctors here and in Omaha truly believe that having the opportunity to live life is just as important as treatment. 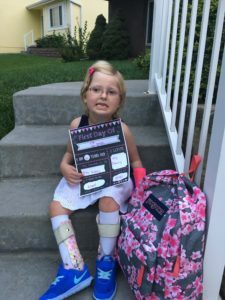 Thankfully our doctors decided it would be best to let us enjoy the rest of our summer and do all the things we had planned, and let Emma settle into first grade before starting treatment again. We were so incredibly thankful for one more month of life away from treatment and made the most of it. Emma went to Camp CoHoLo, which is a camp for kids who are currently or who have battled cancer. Mom was nervous to leave her overnight for three nights, but she had the most amazing time! We cannot thank everyone at camp enough for making this such a fun week for Emma and all of the kids. Brent and I also had a chance to take a vacation without the kids, which we haven’t done since before Emma was born. We had such a wonderful and relaxing time visiting friends in Idaho. It was a great time to relax and recharge. We then came home and got ready for school. Emma started first grade in August and absolutely loves it. We are so incredibly thankful for all of her friends and teachers at Walnut Creek that make school such a great experience for her. To add to the crazy, we moved out of our house that we have lived in for the last 10 years. Life has been quite the adventure the last few months. We are looking forward to moving into our new home that will be more accessible for Emma in a few weeks! 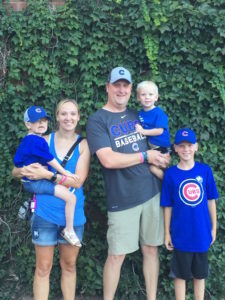 go site About a week after school started in August we started chemotherapy again. Emma is now taking Actinomyocin-D and Vincristine. This regimen will be for a year. She gets Vincristine every week. She has had Vincristine before and seems to be tolerating it alright so far. She then takes the Actinomyocin every third week. This drug has been pretty hard on her. She gets it on Fridays, and the weekends we have done it she has been fairly sick and nauseous. The doctors have been making slight adjustments to nausea meds each week, so it has improved, but she still feels pretty awful after having it. It is so incredibly hard to watch how hard the treatment is on her. The last week Emma’s hemoglobin was low and she needed a transfusion. We did both chemo meds on Friday and then she got a fever on Saturday, which resulted in a trip to the ER. We found she had another UTI, which was causing the fever, but Emma was so sick from chemo that she couldn’t keep oral antibiotics down, so she had to be admitted to the hospital and have antibiotics run through her port. It has been a long week, but she seems to finally be feeling better. This new treatment is definitely very hard on Emma. It has been really hard going back to life on treatment. There is so much extra worry and watching Emma struggle through treatment is so hard as a parent. We continue to pray that the chemo is working and that all of this is worth it. http://maientertainmentlaw.com/?search=how-long-does-levitra-pills-last-usage That brings us to tomorrow. We flew into Boston today and will head to the hospital tomorrow morning for our routine three month scans. We are of course so nervous to hear if the new treatment is working or not. You would think after all this time scan day would get easier, but it just doesn’t. All of the anxiety, worry and stress of finding out the results is weighing heavy on us right now. We will scans tomorrow morning, see ophthalmology, then go to clinic and see our oncologist and neurologist in the afternoon. Then we will see dermatology and endocrinology on Thursday. It will make for a busy and stressful few days, but we are trying to remain hopeful that the treatment is working and we will get positive news. We haven’t been very good about updating on here lately, but we know there are so many of you that care about Emma and so if you have a few minutes tomorrow we would take a few extra prayers for positive scans. http://cinziamazzamakeup.com/?x=viagra-generico-50-mg-in-farmacia-senza-ricetta-pagamento-online-a-Verona The last two months have been hard on Emma, and watching her fight through chemo is humbling. Emma continues to show us through the hardest of days what it means to be strong and brave. She is simply amazing! September was childhood cancer awareness month and I read a saying on Sammy’s Superheroes’ Facebook that rang very true as we watch Emma work her way through treatment. http://cinziamazzamakeup.com/?x=levitra-20-mg-economico -To know a child with cancer is to have your life forever changed. Their courage will amaze you, their stories will shake you, and their faith with strengthen you. http://maientertainmentlaw.com/?search=canadian-drugstore-meds-viagra-professional There are so many little ones out there battling and this is why we fight for them! They are true inspirations for what true strength and bravery are. Thank you to all of you who continue to support research and all of the many families fighting this awful disease! viagra professional in uk We will try to get another update written tomorrow to let you all know how scans went. Thank you to each and everyone of you for your love and support! EmmaStrong! !